Staff Selection Commission conducted the Combined Higher Secondary (10+2) Examination, 2015 on 01.11.2015, 15.11.2015, 6.12.2015 & 20.12.2015 and re-exam on 23.07.2016 for recruitment to the post of Data Entry Operators and Lower Division Clerks at various centers all over the country. 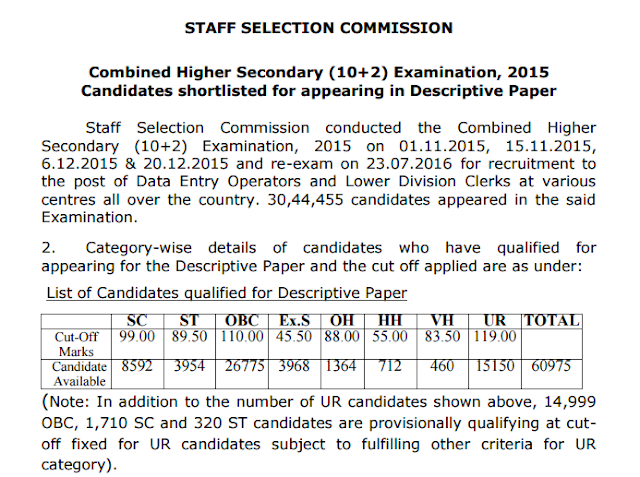 30,44,455 candidates appeared in the said Examination. NOTE: The Commission in conformity with para 12 of the Notice of Examination, has decided to conduct Paper-II of descriptive nature of 100 marks. This paper is tentatively scheduled to be held on 18.09.2016. A brief explanatory note on Paper-II would be hosted on the website of the Commission soon.